The University of Maine football team will hold the first of its three spring scrimmages under new head coach Nick Charlton at 10 a.m. Saturday at Morse Field in Alfond Stadium in Orono. The scrimmage will last approximately two hours. 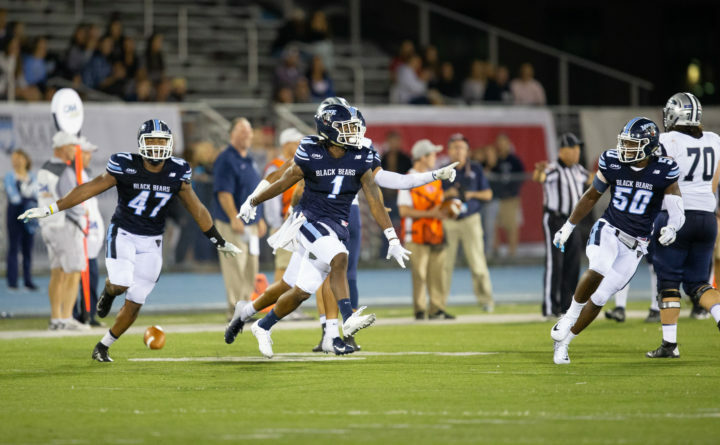 The Black Bears return eight starters on offense and eight on defense off last fall’s team which became the first in school history to reach the Football Championship Subdivision semifinals. The Black Bears finished 10-4 overall and won the Colonial Athletic Association championship by virtue of its 7-1 record. Charlton said when the first-team units square off, he will be looking for them to be strong mentally and to execute. He wants the offense to take another step forward next season. “Our defense was dominant last season and our offense was very good. But I want our offense to be dominant next season,” said Charlton. The players are making a transition to a realigned coaching staff. In addition to Charlton being promoted from offensive coordinator to head coach, replacing the departed Joe Harasymiak, Andrew Dresner was promoted from wide receivers coach to offensive coordinator and Mike Ryan was named the defensive coordinator after being the linebackers coach and recruiting coordinator last season. Harasymiak left UMaine to coach the defensive backs at the University of Minnesota. Justin Flores (wide receivers coach, recruiting coordinator), Jared Keyte (special teams coordinator, safeties) and Dean Petzing (tight ends) remained and Charlton hired four new coaches in Kurt von Bargen (defensive line), Makana Garrigan (running backs), Reggie Garrett (cornerbacks) and Mikal Myers (outside linebackers). One priority this spring is developing a capable stable of running backs. Last year’s leading rusher Ramon Jefferson (182 carries, 1,037 yards) is serving an indefinite suspension after being arrested for domestic violence assault and criminal mischief in February. Joe Fitzpatrick, UMaine’s No. 2 rusher (120 carries, 476 yards), has been battled injuries throughout his career and won’t participate in any of the three scrimmages although he is working out with the team. So backs such as junior Elijah Brooks and redshirt freshman Adrian Velez will get a chance to advance up the depth chart. Charlton said he intends to bring in at least two more running backs for the fall, including a possible transfer. Velez carried the ball 14 times for 78 yards in three games and Brooks had one carry for three yards in four games. Two highly-touted players who joined the program in January will also get the opportunity to get some spring ball under the belts: tight end Ori Jean-Charles, a tight end who transferred from Football Bowl Subdivision team Louisville, and linebacker Xavier Nurse of Brooklyn, N.Y. The UMaine women’s basketball team ranked second in New England in attendance last season behind perennial national power the University of Connecticut. The two-time America East champion Black Bears averaged 1,781 fans over 14 games, including three America East playoff games. All but two of those games were played at the Cross Insurance Center in Bangor, the team’s home court. UMaine drew 1,891 per game at the Cross Center. A season-low 1,008 turned out for a regular-season game against Stony Brook at the Augusta Civic Center and 1,233 showed up at the Memorial Gym in Orono for the Black Bears’ AE semifinal win over Albany. UMaine averaged 1,700 per game for its regular season games, 1,770 at the Cross Center. An average of 2,077 watched its three playoff games including 3,234 for the America East championship game win over Hartford. UMaine averaged 1,612 fans per game during 2017-2018. UConn was second in the country in attendance last season with an average of 10,026 per game. UMaine will hold a postseason party on Friday, May 3, beginning at 6 p.m. at the Sea Dog Brewing Company in Bangor, to celebrate its America East championship. The cost is $30 and those interested in attending are asked to register by April 26.